Meghan graduated from Northeastern University in 2014 earning a BS in Rehabilitation Sciences and a Doctorate in Physical Therapy. She has experience working in a variety of healthcare settings including outpatient, acute care, and subacute rehab. She uses a combination of manual therapy, exercise, and education to assist patients in reaching their individual goals. She enjoys working with a wide range of orthopedic diagnoses relating to the spine and extremities. She focuses on promoting core and postural strength to correct muscular imbalances that can lead to pain. She has also attended continuing education on vestibular dysfunction and specializes in treating vertigo and balance impairments. 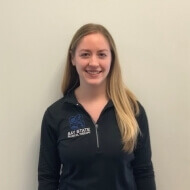 Meghan completed a clinical rotation at Bay State PT in South Boston in 2013 and then rejoined the team in 2017. She lives in Southie and enjoys having the opportunity to work in her neighborhood. When not working, she loves to travel, take yoga and Pilates classes, and spend time with friends and family.